My homemade apple pie is so good, when anyone finds out I made one they invite themselves over. No shame. No made up stories. They just say, “I heard you made pie. I’m coming over.” Homemade apple pie is the most famous American dessert and what a treat it is when it’s made from scratch, especially a deep dish apple pie like mine. No matter how much money you have, there is no place you can buy apple pie like homemade. And this is a healthier apple pie because there is no butter anywhere. The crust is made with olive oil! I used to be intimidated about making pie and it was always about the crust. Not only was is tricky to do with the ice water method, but who wants to eat all that shortening or butter? Once I discovered that an oil crust is not only flaky and delicious, but super easy to make, that’s all I use now (try my chicken pot pie). With an oil crust most recipes say to pat the crust into the pan but I say put it between wax paper and roll it out. This way it’s an even thickness and you just have to trim the edges. Another thing I like about oil crusts is you can patch it wherever there is a hole or crack. Just put some extra dough there and press. Actually, you HAVE to roll the dough to make apple pie because you need a flat top crust. It has to be one flat piece that’s rolled out and you just lay it on top, crimp, brush with milk, sprinkle on some sugar, cut some vents, and bake. This pie bakes for almost an hour so you need to protect the edges of the crust from burning. 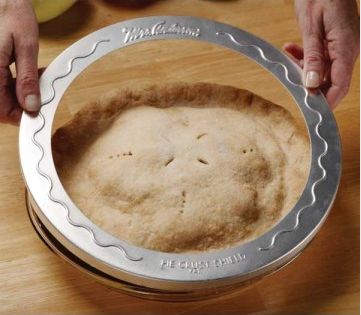 That requires a pie ring or shield like the one pictured below. They sell for about $5 and are much easier to use than making your own out of foil. 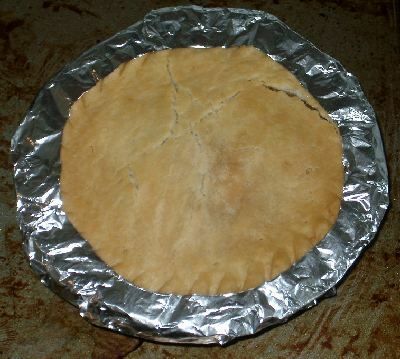 But if you need to make your own, the easiest way is to cut a circle of foil that’s large enough to cover the whole pie and then cut a big crcle in the center, leaving the entire center of the pie exposed and just the edges of the pie crust covered. Tuck the rest of the foil under the rim, just like the photo below. 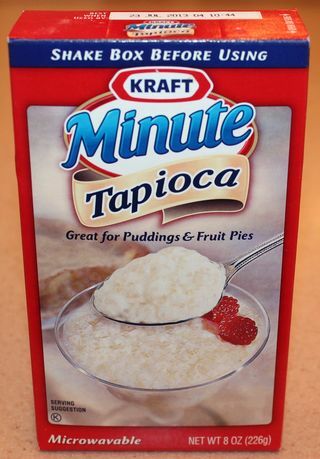 For anyone not familiar with tapioca, it is a starchy substance used in puddings and as a thickener but if you can’t find it you can use all-purpose flour instead. 11 Comments on "Homemade Apple Pie"
I use a deep dish 9-inch pie pan (Emile Henry brand). After following your recipe for Apple pie I can’t wait to bake one myself! Also, I am looking forward to more of your great ideas and thank you for your excellent presentation. A couple days ago my brother brought me a full basket apples out of his garden. I happened to see that same evening the movie “Labor day” where Josh Brolin and Kate Winslet are making a delicious peach pie and that gave me the idea also to make a pie but with using the apples from my brother instead of peaches. Eventually I found on the internet your video on YouTube and also your recipe about to make a homemade apple pie. Yesterday I decided to bake one. This morning it really looked and more importantly tasted magnificent! Great recipe and a healthy alternative using olive oil instead of butter. Thank you so much! 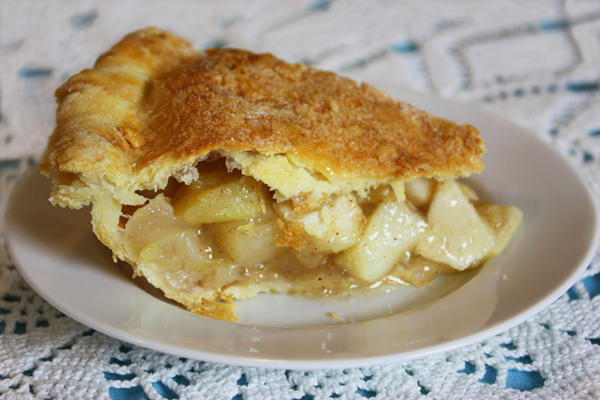 You’ve got a new friend from Belgium who’s crazy about American apple pie! I live in the Caribbean and I am very particular about my diet so this recipe suits me. I made the pie about 2 hours ago and couldn’t wait to sample it. Instead Tapioca, can I use Corn starch as a thickener. Does it make any difference? Flour would be a better choice as a substitute for tapioca. Jenny I just love your videos and your recipes. You are so entertaining and funny and your set is so clean and colorful. I also love the fact that you are so professional and don’t say uh and you know every other word like a lot of people do in their videos. I picked all the rest of the granny smith apples off my little tree and I’m going to make your pie tomorrow. 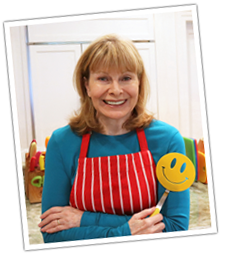 Thank you so much for so many free recipes I have copied you won’t believe how many. That looks amazing! I wanted to share something with you. Yesterday morning I made your lemon bars. Anyway, we had unexpected company in the afternoon and needless to say they ate them all:( you received so many compliments and I was so happy for you. And today I’m going to make them again because me and mike only got one each. 🙂 thanks so much for your incredible recipes! !